Breach investigations on Hospice of North Idaho (HONI) and AHMC Healthcare have made the fact crystal clear that how much critical it is to understand the risk associated with the electronic protected health information (ePHI). The spokesperson of HHS has made the statement on the HONI case that,“HONI did not conduct an accurate and thorough risk analysis to the confidentiality of ePHI as part of its security management process from 2005 through Jan. 17, 2012”.It requires no explanation that repercussions of these breaches are not only financial fines but reputation damage also. What is Health information Portability and Accountability Act (HIPAA)? The Health Insurance Portability and Accountability Act (HIPAA) was developed in 1996 and included in the Social Security Act. The requirement for privacy regulation was realized when huge volume of health information was being recorded and exchanged electronically. Before HIPAA, there were very few laws in place to help retain a patient's privacy when their medical records were recorded electronically rather than in the once-standard paper chart. HIPAA also known as Kennedy–KassebaumAct, it has five titles. Title I covers protection of health insurance coverage for workers and their families when they change or lose their jobs. Title II of HIPAA, known as the Administrative Simplification (AS) covers the security and privacy of health data. Title III covers Tax-related health provisions governing medical savings accounts. Title IV includes Application and enforcement of group health insurance requirements. Title V covers revenue offset governing tax deductions for employers. As an information security professional point of view Title II is focus area and same we are going to discuss in details in this article. Why Risk Analysis in HIPAA? The intend is very obvious, the controls listed in HIPAA are bare minimum and risk associate with used technology or environment specific has to be assessed and addressed separately. Actually risk assessment helps organizations to optimize their security budgets and gives a strong logical business case to get support from all stake holders to implement the HIPAA controls and helps them to take the decision on critical issues like where and how money and efforts are required to be protected. A proper risk assessment result can be used to give the prioritized approach for control implementation and provides a roadmap and mile stones like which issue needs to be addressed first. The result of control implementation post proper risk assessment is more efficient and effective as it addresses the actual security concerns beyond compliance. In such a dynamic world where Technologies change so fast and threat vectors grow every day, is it not required to address upcoming threats and vulnerabilities specifically? Or should we not analyze the risk frequently to evaluate the effectiveness of the controls? Risk analysis for HIPAA must be formal exercises that mean it has to be comparable and structured approach. It is important to understand the business process and environment to avoid a mechanical approach. Next step is to identify the Risk Assessment methodology, there are best industry methods that can be adopted e.g. OCTAVE, ISO 27005, NIST Sp800-30, and FAIR. It is important to understand that what all process, information, people, Technology including locations has to be covered in HIPAA for Risk assessment exercise. The critical point in threat identification is to cover all types and kinds of threats, like deliberate, accidental internal, external, natural anything that can exploit the security flaw. A competitor of your vendor may be an example of outside deliberate threat, which has an interest to delete or expose your ePHI, just to prove that your existing vendor is not good enough. Existing weakness and flaws including both process level and system level must be identified. It is important to identify the newly discovered security flaws. All the vulnerabilities must be classified on the basis of it ease of exploitation. An application that has SQL injection flaw, or storage of ePHI in encrypted laptop, or having bulk of critical data post retention period and without business need in insecure way can be example of easy exploitable. Once organization has identified Assets and corresponding threats and vulnerabilities, risk can be calculated as a function of Asset Value, Level of Vulnerability and Likelihood of Threat. Risk can be calculated, qualified and quantified as per requirement. It has to be ensuring that effectiveness of the existing controls has been calculated while assessing the current risk. The important point is to remember that there are certain risks that cannot be quantified like reputational risk. All risk must be classified as per the score or risk criteria. All Identified Risk must be mitigate do bring it to acceptable level. 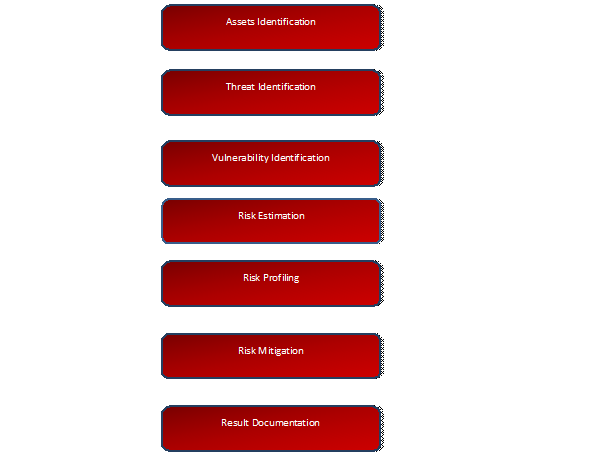 Risk identified must be treated, tolerated, transferred or terminated or it can be combination of any of these. In case of risk transfer you must do third-party risk assessment. The Formal risk assessment must document the process, scope, assets, threats, vulnerability, existing controls, risk profile, risk acceptable criteria, risk mitigation method and action plan with status. Besides above mentioned information, the documentation should cover date of assessment, assessor and approver name. Unfortunately organizations realize the fact when attack has been materialized that they have not assessed the risk properly. Risk assessment gives a way to implement Information Security in an effective and efficient way. We must remember that HIPAA Risk assessment is not a compliance status, but actual review of security posture of the organization." Author: Swati Sharma, PCI QSA, CISSP, CISM (Q) ISO 27001 LA, MS (Information Security and Cyber Laws –IIIT Allahabad).